Vancouver’s early fall weather has been typically erratic. Sunny and gorgeous some days and pouring down rain on others. 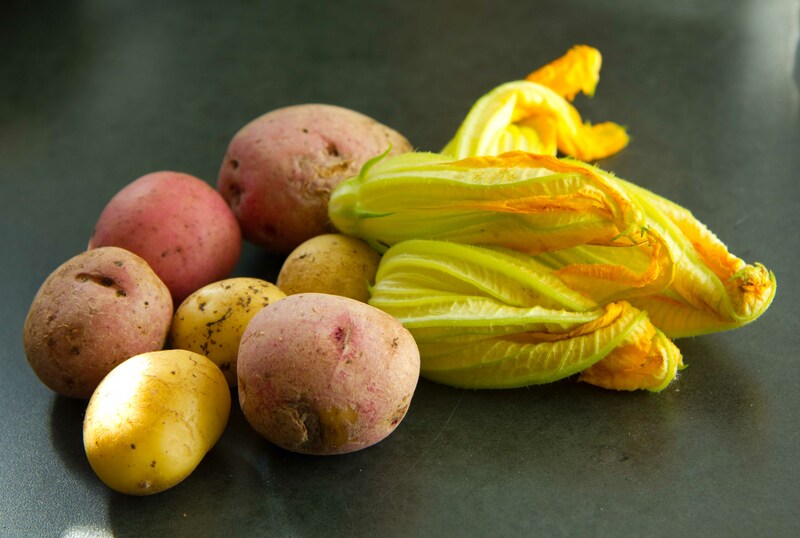 This past Sunday, I woke up to Mr. Sunshine beating down on my face so I took advantage of the dry weather to get into the vegetable garden to forage for the end bits of my harvest. Looks like it’s time to do some maintenance. 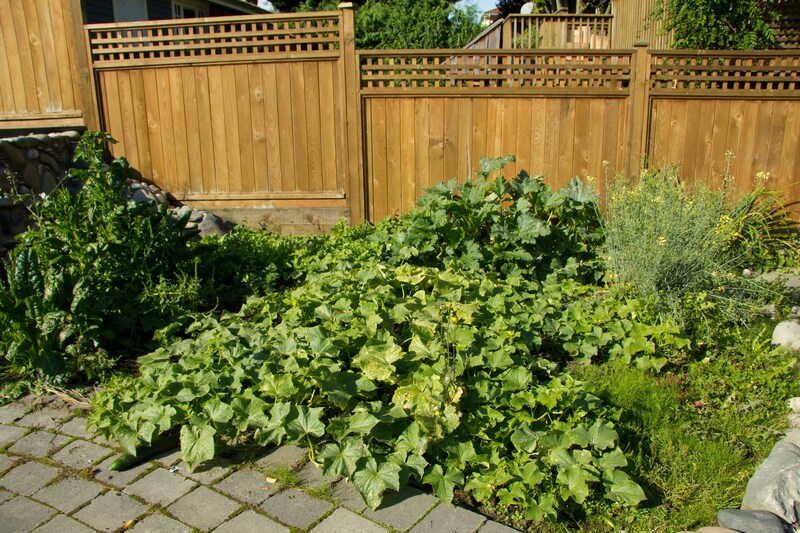 Since I hadn’t been in the garden in over a week, I discovered gargantuan sized cucumbers, zucchini and spinach. I guess the rain help feed what Ben and I refer to as our “nuclear garden” and created monsters and although I know my culinary skills should be open to all of Mother Nature’s bounty, giant vegetables freak me out and I cannot bring myself to cook with them. 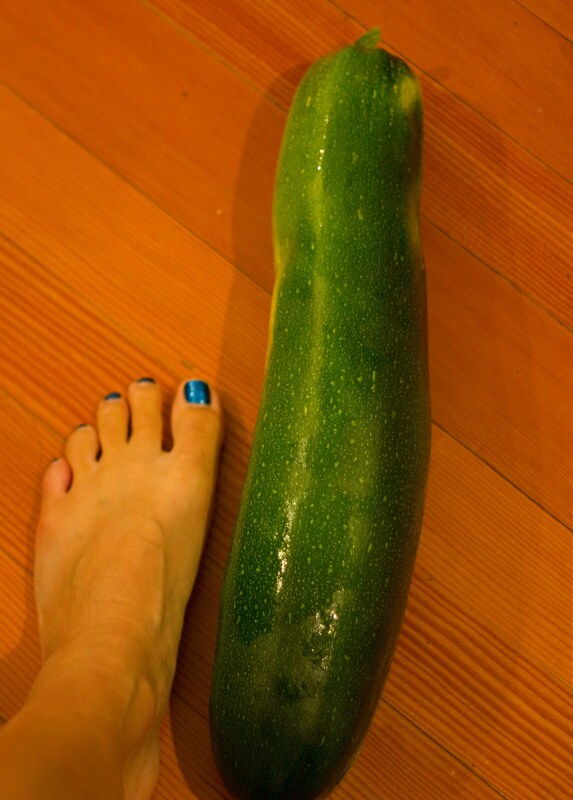 I know… it’s not the prettiest foot but check out the size of this zucchini! So with much guilt, I pick all the monsters and packed them to give away to willing takers at work and searched for the “‘perfect” specimens to use for myself. Vegetables this size inspire me to make wonderful meals. 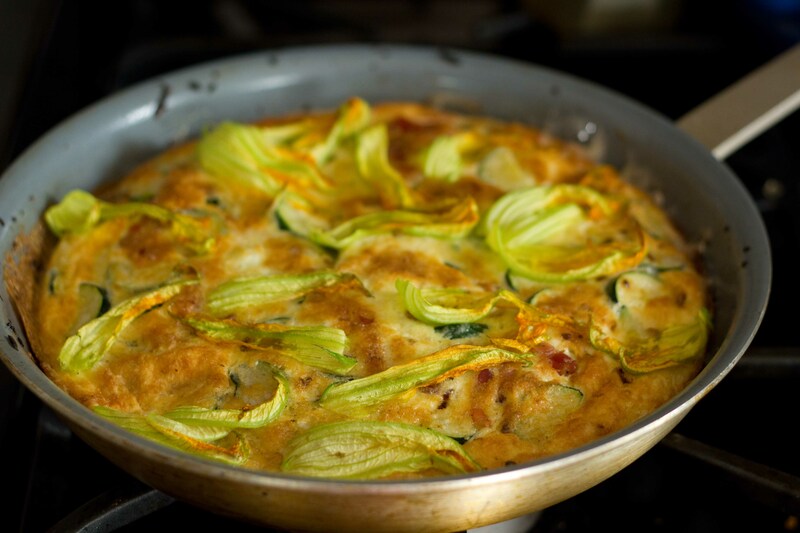 With the perfect-sized zucchini and blossoms in hand I decided to make a frittata for breakfast. 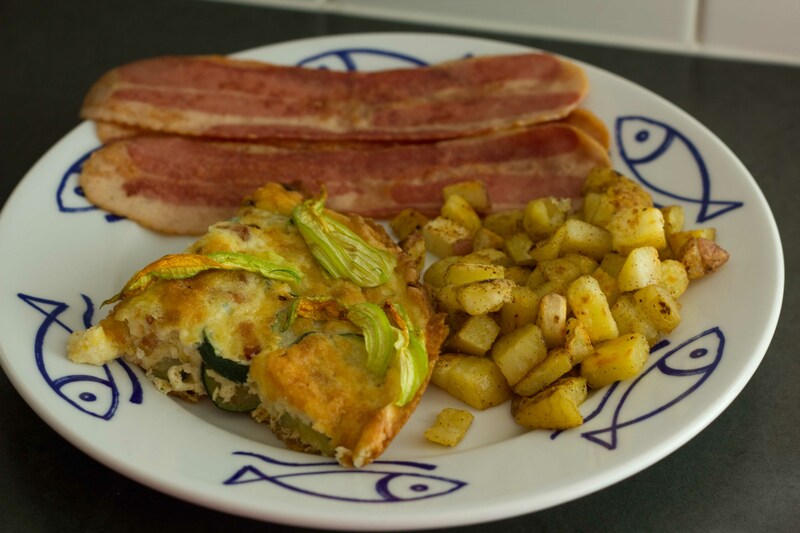 I used the last of the potatoes in the garden to make some hash browns to accompany the meal. The potato harvest was good this year. Don’t ask me when I took a liking to frittatas because before this year I don’t think I’ve ever had one. This summer, they’ve been my quick go-to meal. I just saute up whatever veggies, (or prawns) I have on hand, whisk up a bunch of eggs, whatever cheese I can find, add some lemon zest and a squeeze of juice and then pour it all in a smoking hot buttered pan. A quick swirl of the pan and then I throw it in the bottom of the oven at 425° until it’s almost set and then under a broiler until the top colours. I added the squash blossoms when I put the pan under the broiler, but probably would have been better off had I added them before the top set. The potatoes were chopped up, quickly boiled and then fried over high heat. A dash of s&p, some garlic and celery salt and Voila! Home fries! Don’t judge me because I eat turkey bacon. No it’s not as good as the real thing, but it’s marginally better for you and doesn’t make your house stink as much when you fry it. I found another zucchini a bit bigger than my perfect one above and decided that it should be eaten as well. I needed a quick “clean” pre-hockey meal so I whipped up a quick green sauce to put on top of pasta. 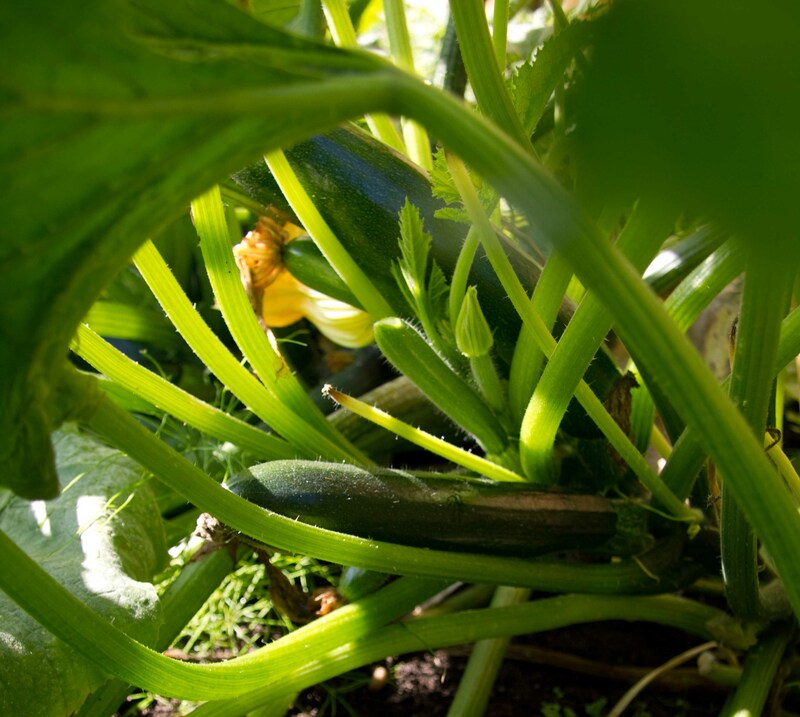 Slice a zucchini in half or quarter lengthwise depending on the size. Chop into 1/2″ pieces. 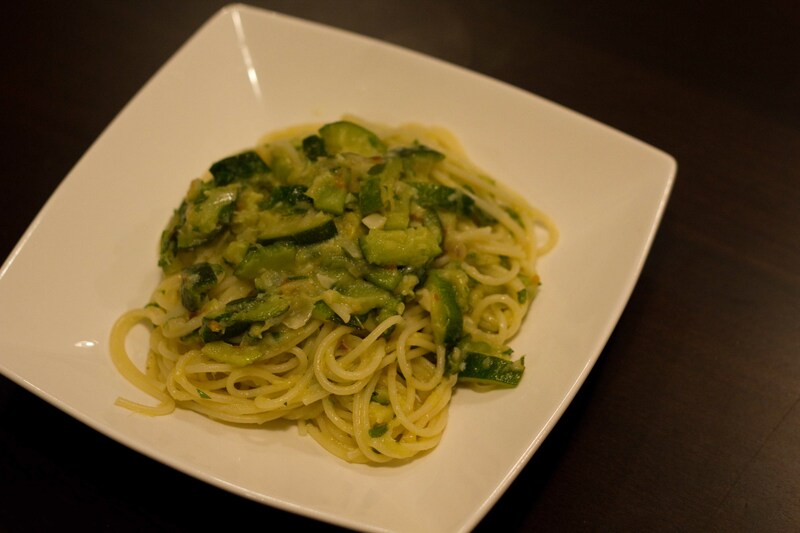 Add olive oil to a hot pan and sprinkle in chili flakes, after a moment add the zucchini, minced garlic clove and some finely diced onion or shallots if you have them. Cover and leave over medium heat for around 10-15 minutes. Add some lemon juice and with the back of a wooden spoon smash the zucchini. Add the pasta with some pasta water to make a sauce. Season with salt and pepper and grate in some parmesan. Enjoy!